UK: GE Renewable Energy will test its 12MW Haliade-X turbine at the Offshore Renewable Energy (ORE) Catapult's test centre in Blyth, northeast England, as part of a five-year deal. The world’s largest wind turbine will go through test and demonstration programmes to "replicate real-world conditions" at ORE Catapult’s 15MW power train test facility. GE’s Haliade 150-6MW turbine, which is already commercially available and in operation in the US and China, will also be subject to the research and development activities, ORE Catapult stated. No fixed date has been set for testing the 12MW turbine as it is still in development. The 6MW drivertrain is due to be delivered over the summer to begin testing, an ORE Catapult spokeswoman told Windpower Monthly. GE’s two Haliade turbines’ cooling technologies, converters, and loading conditions across mechanical and electrical components will be tested, the partners said. They will also be subject to grid testing and design validation. The Blyth facility is capable of recreating extreme conditions in an onshore environment up to 15MW and of replicating the effects of the wind including dynamic torque, axial and radial force, and bending moment application, ORE stated. 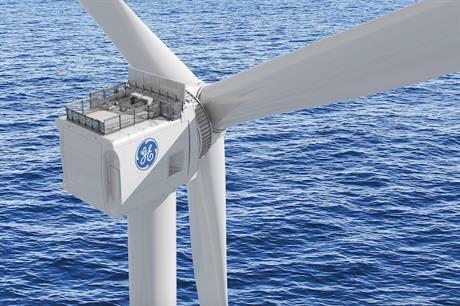 GE first announced its 12MW direct-drive turbine, which will have a 220-metre rotor, 107-metre blades, and a tip height of 260 metres, in March. The manufacturer had previously stated that it would first test the turbine’s nacelle at its factory in Saint-Nazaire, France. Through testing at Blyth, GE hopes to "accelerate prototype certification" of the 12MW turbine, it stated. John Lavelle, president and CEO of GE’s offshore wind business, said the agreement would enable the manufacturer to subject the Haliade-X to "controlled and extreme conditions" in a "faster way". He added: "Traditional testing methods rely on local wind conditions and therefore have limited repeatability for testing. "By using ORE Catapult’s facilities and expertise, we will be in a better position to adapt our technology in a shortened time, reduce unplanned maintenance, increase variability and power output, while introducing new features to meet customers’ demands." The agreement also includes a £6 million (€6.85 million) combined investment with government funding scheme Innovate UK and the European Regional Development Fund (ERDF), to install what the partners claim is "the world’s largest and most powerful grid emulation system". GE Power will supply its Grid Emulation System, which will enable researchers to assess how the next generation of large-scale turbines interact with electrical distribution networks in more challenging environments. It will also enable testing of different wind turbine configurations — including doubly fed induction generators and synchronous generators without a fully rated converter.